Now here's a beer that confused the hell out of me. It was Kristen who worked out what it was. It's the brewhouse name, you see. EX/BM. Confusing because BM was the name of another, very different beer: Best Mild. This obviously isn't an export version of their Mild. It looks nothing like a Mild recipe. Yet, surprisingly, I've just noticed Mild is how RateBeer classifies it. So I guess it must be. It's not as if they could ever classify a beer incorrectly, is it? As you can see, Whitbread seemed to think it was a Pale Ale. But what would they know? They only brewed it, after all. Before I forget, can you see the way the chav on the label is dressed? That's the traditional costume of brewers, who for some reason wore a red cap. That and the foaming tankard are obvious attempts to make the beer appear olde worlde. Which is ironic. Because the beer is nothing like a traditional Pale Ale. For a start, the grist is pilsner malt and sugar. Which leads me to believe that it must have been colour adjusted with caramel, because it's given as 15 EBC on the brewing record. Then again, that is quite pale - Tankard was 25 EBC. Then there are the hops East Kent and Hallertau. Pilsner malt, Hallertau hops - sounds like a Lager, doesn't it? It's weird how difficult it is to find information on a beer that was brewed until quite recently. All I came across are cans, trays and labels from collectors and trademark information. From which it appears that it was first brewed in 1967 or 1968. While the trademark has expired in many countries, in the UK it's still valid until 2016. Getting back to the beer itself, I'm not quite sure where Kristen got that FG of 1014 from. It's actually 1006.5, making the apparent attenuation 86.65%. It must have been a very dry beer. Though not particularly bitter as the hopping rate was low - 0.8 lbs per barrel as compared to 0.6 for the much weaker Best Mild. It's complicated by the fact that the original used hop extract. The sugar in the original was WSM, which I'm pretty sure stands for Whitbread Special Mix. What that was, I don't know. From the beers it was used in, I think Kristen's guess of No. 2 invert isn't bad. Notes: As we continue into the 70’s with yet another of the delicious Whitbread ales, we come to one that to me, looks exactly like it was trying to compete with the likes of the Heineken’s and Stella Artois’s of the beer world. The recipe is pretty much spot on for a nice little German lager except for the addition of the little sugar…darker invert sugar at that. Seems they couldn’t make up their minds if they really wanted to go all the way and make a lager or make this ale, lagerish, but couldn’t let go of the habit of adding buttloads of sugars to their beers. Either way, this little blighter most assuredly would please a lot of the ‘lager boys/girls’ out there. That’s just my opinion anyway… This beer is a very quick, very simple, moderately stronger pale ale, for drinking by the masses. I’d really like to know how was this viewed compared to the Tankard? Was this the ‘luxury’ beer compared to the other?? Malt: Pilsner malt. Simple. However, I’m not sure if what they are referring to was actually from Plzeň or just a ‘pils’ type malt. My guess would be the latter. Choose any non-DMS’s pils. Whichever is your favorite. Hops: Goldings seem to be the theme with these logs. The vast majority of which were middle Kents. That being said, they seemed to always add about 10-20bu of hop extract. Every single log, without fail has a similar addition. We aren’t worried about that, we can just add more of the tasty Kents. For this recipe, its very cool to note the large addition of fresh Hallertauer hops which, would again, reinforce the lager character. Yeast: Whitbread yeast. Two choices. Wyeast 1098 (more tart and dry) or Wyeast 1099/Safale S04 (more fruity and malty). Sundries: Same as last week. Nothing fancy about this recipe. One of the very easiest to produce. Wasn't the name Brewmaster associated with JW Green at one time? It certainly looks like they have borrowed the logo. Do you know where they were brewing this? Whitbreas's Oakley Road opened in 1969 and looks ideal for producing this sort of keggy nonsense. It was also where Stella was brewed for the UK market. I'm surprised they didn't try parti-gyling them. Perhaps they did. Oakley Road was probably the largest short-lived brewery in the world. Here is a link for anyone who likes this sort of thing. no, I hadn't seen that. I don't think I've ever owned that book. 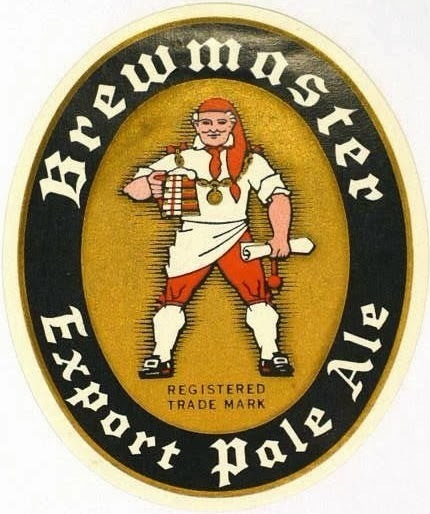 Brewmaster was definitely considered more upmarket than Tankard. I remember drinking it in the eponymous pub just off the Charing Cross Rd. this was taken from the Chiswell Street records. Thanks for the link. It's not the only giant keg factory not to have lasted long. Courage's brewery close to Reading didn't hang around much longer. Ron -- copies available very cheap. A complete catalogue of beers from every brewery in the UK at the time with brief tasting notes -- very useful reference for the period. definitely top-fermented. 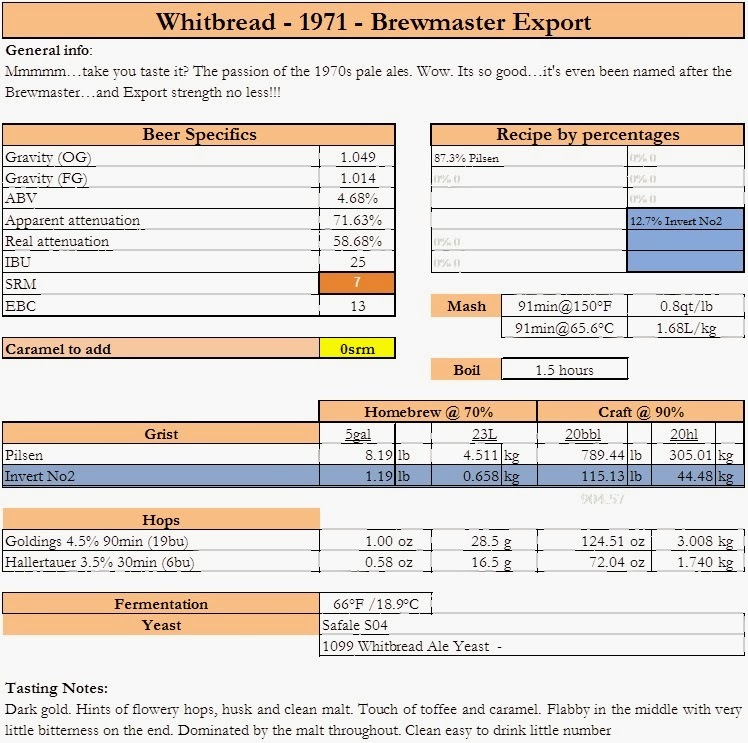 It was pitched at 60º F.
just ordered a copy of the Beer Drinker's Companion. It's my Christmas present to me. Certainly a key progenitor to Jackson, along with Richard Boston and, earlier, Andrew Campbell. Barnard too of course. I worked at Oakley road for a while in the 70's as a lab rat. Brewmaster was, as far as I remember a completely separate beer from anything else, as it was brewed in large quantities - it definitely was not related to Stella, which was also brewed there. I suspect the comment about it being a Greens recipe is correct. It was also a favorite for mixing with Gold Label Barley Wine - a nip and a 10 oz can or half pint bottle.